For much of the 20th century, young people could count on hearing this advice: “Get a government job. Stable, good benefits. Can’t go wrong with a government job.” That advice has really never been more true than now, as the public sector is growing by leaps and bounds. Even more significantly, though, as government and private sector industry and corporations become more tied together, the traditional public sector is becoming more complex. While politicians may make laws and direct policy, someone has to run things at the ground level. The Bureau of Labor Statistics predicts significant growth over the next decade in the field of public administration, as the need for experienced, capable managers, administrators, and leaders becomes ever more critical. And as the need for upper-level professionals grows, so to does the need for higher degrees to weed out the applicants. Working professionals in public service positions are looking for credentials to prove their fitness for promotion, and young graduates just coming out of school need to compete; in both cases, the Master of Public Administration is the standard. For in-service public workers, and for many prospective public servants alike, an online MPA program may be the best choice. Most people in a professional position cannot afford to leave their jobs to go back to school, and others just need to work to make ends meet. With increased demand, online MPA programs are proliferating quickly, but they are not all reputable. The Value Colleges mission is to provide prospective students with the information they need to make the best decisions for their education and their finances. By ranking schools with the perfect balance of educational quality and affordability. The Value Colleges method gives students, from working adults to new college grads, confidence that their graduate degree choice will give them a worthwhile return on their investment. Our #1 Best Value Online MPA Program, the University of Missouri – Mizzou to students, alumni, fans, and friends – is a Carnegie Foundation top-tier research university that stands on a long line of firsts: the first American journalism school, the first homecoming celebration, and the first public university west of the Mississippi River. Mizzou is also well known for their online programs, not a surprise in a large state with many rural communities. Known as the Tigers, their mascot, Truman the Tiger, is named for Missouri native and former President Harry Truman. Truman lends his name as well to the Harry S. Truman School of Public Affairs, a relatively young public affairs school (founded in 2001) on a mission to become the foremost program of its kind in the Midwest. The Truman School offers a fully online MPA program designed especially for professionals working in the public administration field to improve their credentials and progress in their careers. With all work completed online, working adults can get their MPA degree in a flexible and convenient format, and Mizzou’s low tuition makes it a world-class value. Coming in at a strong second, the University of Nebraska Omaha is a model for schools in its class. As modern economic changes require Nebraska’s traditional agriculture and manufacturing-based economy to expand to include technology, investment and finance, and healthcare, the work that UNO does as a metropolitan research university is becoming more important than ever. And it shouldn’t be surprising that UNO’s student body is growing by leaps and bounds, expected to exceed 20,000 in the next few years. Nebraska’s workers need what UNO has to offer. As the University of Nebraska system’s main urban campus, UNO’s College of Public Affairs and Community Service can only become more important as time goes on. The School of Public Administration offers a strong Master of Public Administration degree program that can be earned completely online. As the first NASPAA-accredited MPA program offered online, UNO’s MPA has been offering students flexible, top-quality public administration eduction since 2000, so students can be certain they’ve had time to get it right. With 7 concentrations and specializations, and a low tuition rate, the University of Nebraska Omaha is a definitive best value. The largest research university in Colorado, the University of Colorado Denver has exceeded the CU flagship in Boulder, which originally planted the Denver campus as an extension program. Best known for the Anschutz Medical Campus, CU Denver is also a pioneer in online education, having started one of the first fully online, accredited degree programs in 1996, when most colleges thought of the Internet as a fad. Today, CU Denver continues to deliver as many as 30 fully online degrees. Many of CU Denver’s online degrees are medical-related due to the importance of the Anschutz campus, but the School of Public Affairs also offers an entirely online MPA degree. In-state students get the best deal, at $605 per credit hour, but out-of-state students may pay only slightly more, much less than the non-resident rate for on-campus programs. That makes the CU Denver online MPA a great value not only for Colorado students, but everywhere else as well. Part of the renowned City University of New York system, John Jay College of Criminal Justice is one of the foremost schools of its kind in the world; when it was founded, John Jay was the only liberal arts-style college completely focused on criminal justice. As part of CUNY, a system that pioneered open admissions and built the most diverse university system of the day, John Jay College has always been committed to access, making high-quality education affordable and available. John Jay College offers a uniquely specialized MPA degree in its fully-online format. The MPA: Inspection & Oversight program is designed to fill a very specific, very significant need within the public administration field – professional regulators, inspectors, and comptrollers who can manage the complex and vast compliance, risk management, and public safety needs of modern urban areas. In a field that is experiencing a significant shortage of qualified managers, it’s a program that offers high job market value, and at CUNY’s low tuition rates, it’s one of the best values in New York City. The California State University system is built on the idea that education can transform lives, and CSU Long Beach has been transforming lives in the Los Angeles and Southern California region since 1949. With one of the most diverse student bodies in the US, CSU Long Beach is a major force for social mobility among Hispanic, African-American, and Asian-American students. A healthy slate of online degree programs helps Long Beach extend their offerings beyond the campus, allowing even more working adults to find their educational match. One of those fully online degrees at CSU Long Beach is the MPA, offered by the Graduate Center for Public Policy and Administration. With accelerated, 6-week long courses, and a prescribed course calendar, the Long Beach MPA is ideal for working adults to work around their everyday schedules. Full-time students can complete the degree in less than two years, with ample institutional support and clear requirements. And CSU Long Beach’s reputation as a best value extends online as well; their per-credit tuition rate is among the cheapest in California! Consistently ranked among the top 50 public universities in the nation by U.S. News & World Report, Indiana University is a leading research institution in the Midwest. Their location in Bloomington is a nationally known college town, full of cultural activities and vibrant student life, but in recent years, much of IU’s action has been moving online. With fully online programs increasing by nearly 50% in the last three years to over 100 degrees and certificates, Indiana University is making their top-quality education more accessible than ever. IU’s School of Public and Environmental Affairs has seen the value of taking their excellent MPA degree program online. The SPEA Connect online MPA degree offers the same experience of the on-campus MPA program, in a flexible format for working adults. Students can complete all coursework online, and also have the option of attending a week-long on-campus residency if they want to get to know their professors and classmates. Work experience can be used for credit as well, making it possible to finish the MPA online in less than three years and save a little on IU’s already low tuition rate – one of the best deals in the Midwest. One of the most respected private research universities in the US, the University of Southern California regularly ranks in the U.S. News & World Report top 25 nationally, alongside other luminaries like Stanford, MIT, and Duke University. USC is also recognized as one of the most diverse students bodies in the nation, as their commitment to only accepting the best applicants brings them their choice of students; it’s not an exaggeration to say that USC is many families’ dream college. USC’s location in Los Angeles, second-largest economy in the US, gives it a significant edge among universities offering a public administration program. Students in the Price School of Public Policy benefit from deep connections throughout Los Angeles and the Southern California region. With so much demand, USC offers the MPA degree in a fully online format, allowing professionals throughout the region to improve their credentials with one of the most reputable names in higher education. The University of Baltimore is the University System of Maryland’s premiere urban university, located in the center of the city. Originally founded to bring educational opportunity to the working people of Baltimore, UB was solely an upper-division school for most of its history, offering graduate courses and junior/senior-level courses. A full university today, UB’s focus is still on the professions of city life – business, law, and applied arts and sciences. In the interest of making education even more available for Maryland’s working adults, UB’s College of Public Affairs offers a fully online MPA degree that has been recognized as among the best degrees of its kind. While the online MPA offers fewer specializations and concentrations than the on-campus variety – only Public and Nonprofit Administration is available online – online students get the same support and expertise as on-campus students, as well as a manageable tuition rate to keep debt away. A private research university in Washington, DC, American University is one of the most selective universities in the nation (increasingly so, as its reputation draws more and more applicants). American University is regularly cited as one of the most politically active universities, not surprisingly, and a highly diverse, international student body ensures that many voices and interests are heard. American University’s focus on business, law, and international affairs make it an obvious choice for public administration, with all of the necessary expertise and access that its Washington, DC location offers. AU also offers a fully online Master of Public Administration and Policy degree, a 36 credit program (plus a capstone project) designed for experienced professionals and working adults. AU’s exceptional resources and excellent reputation make it a top investment. A U.S. News & World Report Top 10 regional university for the Midwest, the University of Illinois Springfield is a major player in higher education for Illinois and the city of Springfield in particular: almost a third of all college-educated workers in Springfield hold a degree from UIS. As a regional university, UIS’s job isn’t glamorous, but it is necessary – to provide an education to the people who need it at an affordable price. One way UIS does that job is through online education, and their commitment is evident in more than 50 online degree and certificate programs. The UIS Department of Public Administration offers UIS’s award-winning MPA degree fully online, taught by the same experienced, knowledgable faculty and carrying the same stamp of quality as the on-campus program. Students can also earn a number of further certifications online to enhance their degree, including Child Advocacy Studies and Nonprofit Management. With the online MPA, UIS ensures that professionals in public affairs will have a means to an education without having to hit pause in their careers or go deep in debt. A small, private research institution in the suburbs of Philadelphia, Villanova University is ranked as the #1 regional university in the North by U.S. News & World Report. Villanova’s business, law, and nursing schools are considered some of the best in the world. As a highly selective, academically rigorous Catholic university, Villanova’s reputation is securely excellent, and a Villanova degree is a strong job market benefit. Once named one of the most wired universities in the nation (before all universities were wired), Villanova has long had a strong affinity with technology, a fact that comes through in their excellent online programs. Villanova offers an online MPA degree for working professionals with at least three years of related experience in public service, with streaming lectures and online assignments for students to work around their schedules. For a private Catholic university, Villanova keeps their tuition manageable, and with the Villanova name, an online MPA degree is likely to pay off quickly. The State University of New Jersey, Rutgers University, is one of the nine Colonial Colleges still in existence, originally private until acquired by the state to become New Jersey’s land-grant university. With the land-grant mission, to provide practical education to the people of the state, Rutgers has excelled in everything from philosophy to agriculture, with the business school especially respected. In recent years Rutgers Online has been a significant focus, with Rutgers building a slate of accredited, competitive online degrees. One of those online programs is the MPA, offered by the School of Public Affairs and Administration (housed at Rutgers’ Newark campus). With award-winning faculty, U.S. News & World Report recognition, and a large international student body, Rutgers’ SPAA is a school to watch. The online MPA degree offers students the most current public affairs education, with small classes and individualized attention to provide successful support, and Rutgers’ reasonable tuition makes it a solid value. A mid-sized public research university, the University of Delaware has federal land, sea, space, and urban grants for research and a long history, even educating signers of the Declaration of Independence. Well-known for engineering, chemistry, and business, UD is also known as the originator and pioneer of study-abroad programming, becoming a model for universities around the world. Highly ranked by U.S. News & World Report, the University of Delaware’s School of Public Policy and Administration has some of the best individual specializations in the nation. The SPPA offers a fully online MPA degree designed to help working professionals in public service develop the leadership skills and knowledge of current concepts to progress in their careers. UD’s 36 credit program can generally be completed in 30 months, and as Delaware is one of the most affordable states in the northeast, so UD is one of the most affordable colleges, making the online MPA a wise investment. One of the original Public Ivies, and one of three contenders for oldest public university in the US, the University of North Carolina is a model university in many ways. Located in an archetypal college town, UNC has also been one of the corners of the Research Triangle, an area that defined the concept of the tech hub well before Silicon Valley. In recent years, UNC has expanded its online offerings, becoming one of the most elite online educators. With the U.S. News & World Report #15 MPA program in the nation, UNC’s School of Government has made its excellent educational opportunity more accessible to working professionals with a fully online MPA. Designed for experienced public servants in all fields, the online MPA is a 46 credit program that, taking a full-time course load, may be completed in as little as a year and a half. For students whose schedules will not accommodate that level of work, there is flexibility and convenience, making the UNC online MPA a real value. One of the most military-friendly universities in the US, Park University offers bachelor and master’s degrees at over 40 campuses, most of them located on Air Force bases around the US. With its emphasis on military education and providing access for far-flung students, Park has put a great deal of effort into developing more than two dozen online degree programs, making a Park University degree more convenient to obtain than ever. The Hauptmann School of Public Affairs at Park University is recognized as one of the best in the Midwest, with a highly-regarded MPA degree program. The MPA can be earned completely online, and is designed with a multi-disciplinary, liberal-arts focus that makes it accessible to working adult students from a variety of corporate and public backgrounds. Park’s low tuition costs make it a best value however it’s obtained. A historic, private Catholic institution, the University of San Francisco is located in the heart of San Francisco on one of the most beautiful hilltops in the city, overlooking the Golden Gate Bridge and Golden Gate Park. Highly respected for their law school and their connections to Silicon Valley, USF is also recognized for deep ties to the city and a high level of community service commitment, an engagement that informs its excellent public administration programs. Students need never visit campus (though they may be crazy not to) to earn an MPA from the USF School of Management. Coming from the School of Management, the USF MPA focuses on leadership, motivation, and planning, with a special emphasis on the Jesuit values of service and ethics. Online students may also choose a concentration in Health Services Administration, all available fully online. With strong ties to San Francisco and a well-known status on the job market, an MPA from USF is a bridge to a great career. One of the few for-profit universities to achieve regional accreditation and recognition from U.S. News & World Report, American Public University is a unique institution. Founded by a retired Marines officer in 1991, American Public University was designed to meet the educational needs of military service members and veterans, a job first done by correspondence, then online beginning in 1998, making APU among the first online educators. Today, APU has earned the respect of thousands of military personnel and ranking agencies alike. APU offers a fully online MPA degree that makes full use of the expertise of its faculty and students, most of whom are public service professionals with years of experience. This 36 credit program focuses on problem-solving, ethics, and leadership to prepare its graduates for the multi-faceted, diverse experience of public service. And APU’s low tuition – only $350 per credit – makes it a clear value. The flagship public research university for the state, the University of South Dakota is home to South Dakota’s only law, medical, and business schools, and is the center of research and academic life for the region. Founded even before South Dakota’s statehood, USD is relatively small, but has begun extending its reach in recent years with top-quality online degree programs, a natural choice in a large, mostly rural state. USD’s Graduate School offers an unusual Executive Master of Public Administration degree program online, designed especially for public service managers and leaders with many years of experience who wish to move into higher positions or develop their command of public affairs knowledge. For working professionals who have been in the public service field for many years, the EMPA is a chance to bring their learning into the 21st century and learn to manage the rapid changes of today. SDU’s tuition is one of the lowest rates in the nation, making it a low-risk, high-yield educational investment. One of U.S. News & World Report’s top regional colleges for the north, and a Kiplinger’s best value (one of the most affordable private universities in the nation), Marist College has a reputation for excellence and affordability, one of the baselines for being named a Best Value. A Catholic university, Marist is well known for its traditional liberal arts education, as well as for its innovation; as a long-time partner with IBM, Marist has been a test college for IBM’s educational and business products since the 1980s. Marist is not afraid of new concepts, obviously, and that extends to online education. Marist offers a fully online MPA degree program built on Marist’s liberal arts strengths – leadership, motivation, personal relationships, and creative thinking. Students can choose from three concentrations: Ethical Leadership, Healthcare Administration, and Public Management. At only $750 per credit, a tuition rate on par with many public universities, Marist is a value unlike any other. Pennsylvania State University jumped onto the online education train early, in 1998, before most colleges took the Internet seriously as a teaching tool. After all, Penn State had been offering distance education since the 1890s – the Internet was a natural step. Because of that foresight, Penn State World Campus is today known as one of the foremost online educators, a virtual campus with the same high level of credibility and job market value as their on-the-ground counterpart. Demand for experienced public administrators is especially high in the northeast, and Penn State World Campus has leveraged all of Penn State’s expertise into the online MPA degree. With a fully-rounded, multidisciplinary slate of coursework, Penn State’s online MPA prepares students for any area of public leadership; online students can also work toward two master’s certifications for extra credentialing: Public Budgeting & Financial Management, or Public Sector Human Resources Management. Penn State World Campus’s reasonable tuition rate keeps the online MPA a top 20 best value. Like CSU Long Beach, CSU Dominguez Hills is a highly diverse public university that brings educational opportunity to low-income and minority students; over 50% of CSU Dominguez Hills students are Hispanic, along with many Asian-American and African-American students. Frequently cited as a best value, Dominguez Hills is bringing their life- and community-changing education online with a growing number of degree and certificate programs, making sure that more students than ever can jump-start their careers at an affordable price. The CSU Dominguez Hills MPA degree program offers students access to the world of policy administration and management, giving Dominguez Hills students entry into a direct way to change their communities, cities, and states. The online MPS offers the same concentrations as the on-campus MPA – Criminal Justice Policy & Administration, Healthcare Administration, and Public & Non-Profit Management – and the same quality faculty guidance. It’s offered at the same budget-friendly tuition rate as well, $600 per credit hour, a real California bargain. Like the University of South Dakota (#18), the University of North Dakota was there when North Dakota was only a territory, establishing an institution for higher education for a state just beginning. As a public research university, UND is the main site for research and intellectual life for the state, and like USD, UND has begun offering many fully online degrees for students who cannot make it to campus conveniently for classes. The fully online MPA degree, offered by the UND College of Business and Public Administration, is extremely flexible and convenient. The online MPA offers concentration in Healthcare Administration as well as a conventional MPA focused on public policy, management, and leadership, while UND also offers a number of online certifications to add to the MPA, such as Social Entrepreneurship or Policy Analysis. And with all students paying in-state tuition, resident or non-resident, UND can be a best value anywhere in the world. One of the youngest universities ever on the Best Values ranking, Florida Gulf Coast University dates its founding back to just 1991, and because of construction delays never held classes until 1997. But in less than 20 years FGCU has made a major impact in a region, southwest Florida, that suffered from a dearth of higher education. With a focus on applied sciences, business, and healthcare – necessary, practical fields – FGCU is providing the education the people of southwest Florida need. FGCU has been offering online courses and degrees since its very beginning, and even after establishing on-campus courses, they have maintained a strong online presences. The Department of Political Science and Public Administration offers an MPA degree that can be completed entirely online, with concentrations in Public Leadership & Management or Environmental Policy & Planning. With Florida Gulf Coast’s incredibly low tuition, future public service leaders can potentially enter their career with no debt at all. A U.S. News & World Report top regional university for the Midwest, Indiana Wesleyan University is a private, evangelical Christian institution that has also been ranked among the best conservative colleges. Originally a traditional liberal arts college, IWU began offering adult professional degree in the 1980s, beginning a period of growth that intensified with the introduction of online degrees in the 1990s. Today IWU’s online programs are highly regarded and central to its mission. The online MPA program from Indiana Wesleyan is designed for working adults and professionals to schedule around their professional and home lives. As a Christian university, IWU’s MPA emphasizes ethics, social responsibility, and community service, with three areas of concentration: Non-Profit Leadership, Public Management, and Criminal Justice. Strong online student support and low tuition make Indiana Wesleyan a strong contender for best value. A mid-sized regional university in the University System of Georgia, Valdosta State University plays a key role in the academic life and professional preparation of southern Georgia. Not only does Valdosta State educate many of the professional workers of the region, but VSU employs nearly a tenth of the workforce of the area, making an impact of many hundreds of millions of dollars. As a regional university, Valdosta State’s mission is to bring education to those who benefit most. To meet the educational needs of the region, Valdosta State offers dozens of fully online degree and certificate programs, including the Department of Political Science’s MPA degree. Unlike many online programs, which are specifically designed for professionals with experience, the VSU MPA is suited for working professionals and new bachelor’s graduates alike. Two concentrations are available online: Public Sector Management, or Public Policy. At only $293 per credit, Valdosta State has one of the lowest tuition rates imaginable, making it the safest bet around. One of the most respected public research universities in the Midwest, Kent State University is also known as one of the most committed to community service and engagement. Kent State is known for its world-class aeronautics, fashion, and music programs, as well as pioneering work in chemistry and engineering, such as the development of liquid crystals. Kent State Online is becoming recognized as a leader in next-generation education as well. The Kent State Online MPA is the only NASPAA-accredited program of its kind in Ohio, a highly developed 36-credit program scheduled around accelerated 7-week courses. Incorporating experiential learning for working professionals, and strong student support, full-time MPA students can complete the degree in less than two years. With such a turnaround time, and Kent State’s reasonable tuition, MPA graduates can be turning their investment into a career return in no time. A regional, public university in Nacogdoches, TX (a city historically significant for many reasons, not the least for being the site where the Marx Brothers decided to focus on comedy after a disastrous performance as a singing group), Stephen F. Austin State University is best known for forestry, agriculture, and business. It is a major part of the Nacogdoches economy and the most significant educator for much of the East Texas region. Public service professionals in eastern Texas who wish to improve their careers with a master’s degree would be wise to look into Stephen F. Austin State’s fully online MPA degree program. The online program is built for convenience, with students able to take courses at their own pace, one at a time, and SFA’s exceptionally low tuition rate keep it well within the parameters of a bargain. The educational center of the Inland Empire region, Cal State San Bernardino is responsible for educating the citizens of a rapidly changing area. Once overwhelmingly agricultural and industrial, the Inland Empire is undergoing a change as it becomes more suburban and professional, and CSUSB is central to that change. As with many regional universities, San Bernardino is finding that job more manageable with online degree programs. In an area undergoing dramatic cultural shifts, good leaders and managers are essential, and San Bernardino is making their strong MPA program available online to help meet that need. While the Comprehensive Exam must be taken on campus, all other coursework can be completed completely online. Students can choose concentrations in Cybersecurity, Leadership, or Public Financial Management to tailor their degree to their interests or the career paths they are already in, and CSU San Bernardino keeps tuition costs low enough to be a bargain anywhere, especially in California. North Dakota’s sole private, Catholic university, the University of Mary is a small liberal arts university in Bismarck, ND. As a Catholic institution, the University of Mary emphasizes community responsibility and ethical leadership, with “America’s Leadership University” as their rallying cry. The University of Mary takes pride in being one of the lowest-priced Catholic universities in the nation, making their values and knowledge accessible to all. The University of Mary’s accessibility is increased with their growing online degree programs. North Dakota has a severe shortage of credentialed public managers, a shortage the University of Mary is meeting with the online MPA degree program. Mary offers seven concentrations, a high number for online programs (which usually offer only one or two, if any), including Energy Management, Healthcare, and Project Management. 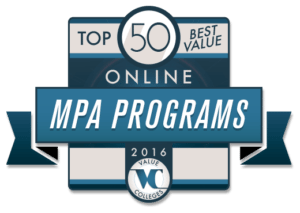 The University of Mary’s tuition makes its online MPA one of the best values possible from a Catholic university. Clemson University has been steadily rising in U.S. News & World Report rankings over the years, as they have made a concerted effort to become one of the top public universities in the nation; their quest has brought them to #21, a considerable increase. Investing more in students than any other comparable university, Clemson has become a nationally-recognized research giant and one of the most respected institutions in the south. Part of developing from a regional university to a national university has been Clemson’s growing online degree programs. Clemson’s MPA offers several concentrations, such as Sustainability and Public Administration, or Homeland Defense and Security. All online students, whether South Carolina residents or not, pay the same tuition rate, making the Clemson MPA a value across the US and beyond. Eastern Kentucky University, a mid-sized public teaching university in Richmond, KY, has been recognized as among the best regional universities in the south by U.S. News & World Report, as well as by Forbes. The Carnegie Foundation recognizes EKU for its service to the community, a commitment that rings throughout EKU’s programs and efforts. EKU’s service mission has also made it recognized as a military-friendly university, with programs designed for the US Navy as well as a strong online presence. EKU offers a fully online MPA degree with two specialized paths: the General track, which offers online certifications in several areas, such as Homeland Security or Fire & Emergency Services for added specialization; or the Community Development path, focused on planning and local/state politics. Designed for new graduates and working professionals alike, the EKU MPA is a low-cost value. The University of Alaska Southeast is one of the most unique institutions in the US – the only place students can major in Alaska Native Languages, and one of the most exciting places for Outdoor Studies, including such programs as the Outdoor Skills and Leadership program, where students learn outdoor survival technique and skills such as kayaking, rock climbing, and hiking. For many UAS students, a national forest is the classroom. Being Alaska, where populations are spread out and often isolated, UAS has developed many fully online degree programs, such as the online MPA. The needs of public managers in Alaska and the Yukon Territory are particular and unique, and no online MPA program can prepare students for those specialized needs like UAS. It’s the best value online MPA in the territory! Founded by the YMCA in 1902 to provide adult education to the working classes of Columbus, OH, Franklin University is a private institution still focused on preparing capable professionals in areas such as business, health, and public service. Franklin’s unique coaching program pairs students with community business leaders for mentoring. Ranked as a military-friendly college, Franklin has been expanding online offerings in recent years to meet service members and other working adults’ needs. The university’s newest college, the College of Health and Public Administration, is meeting the growing need for well-prepared public servants in Ohio and across the Midwest. Franklin’s online MPA degree is designed as the public-sector equivalent of an MBA, preparing students for the demands of a growing field, while allowing working professionals to continue their career while preparing for the next phase. Franklin knows adult education, and everything from convenience to affordability is their area of expertise. Founded as a teacher’s college for Native Americans, the University of North Carolina at Pembroke has been one of the most important forces for preserving the culture and legacy of the Lumbee Nation, an American Indian tribe in southeast North Carolina. One of the most diverse student bodies in the state, UNC Pembroke was at one time the only public Native American college in the US. In recent years, Pembroke has expanded its offerings with highly regarded online degree programs, including an online MPA degree. Many of Pembroke’s most popular and respected programs are related to public service, a special area of expertise, and with the lowest tuition rate in North Carolina, many students have regarded UNC Pembroke as a best value. The University of Texas Rio Grande Valley is about as fresh as a college gets – founded in 2013, UTRGV brings together several smaller institutions into a major regional public university. Situated at the southernmost point of Texas, UTRGV is in one of the fastest-growing areas of the state, and is built to meet the nearly overwhelming educational needs of that population. UTRGV is one the verge of becoming the second-largest Hispanic-serving institution in the nation. UTRGV isn’t starting from scratch, of course – it brings together the expertise of UT Brownsville, UT Pan American, and the Regional Academic Health Center, including well-designed online degree programs such as the online MPA degree. UTRGV builds on current research and expertise to meet the public administration needs of a diverse, booming population. At only $444 per credit, it’s an investment in the future of a great new institution, a new Texas, and a new America. The flagship of the Arkansas State University system, Arkansas State University, in Jonesboro, AR, was founded as an agricultural college, but has since become central to educating the professional class of Arkansas – producing, for instance, the most teachers of any Arkansas college. As times have changed, A-State has kept up, with dozens of fully online degree and certificate programs meeting the educational demands of Arkansas and the Deep South. One of Arkansas State’s online programs, the MPA degree, meets a considerable need in the region for community leaders, managers, and administrators, and does so impressively. This fully online degree program uses internships and experiential learning to prepare both new graduates and working professionals for the upper rungs of responsibility in government, non-profit, and other avenues. The program can be completed in just 18 months, and Arkansas state’s attractively low tuition makes it one of the best values possible. Located in rural Fayette, Iowa, ranked as one of the best places to live in the Midwest, Upper Iowa University is a small, private university on the rise. Major initiatives over the last decade have brought UIU to national attention, not only as a military-friendly institution and a regional favorite, but for its well-designed online education opportunities, a boon in a large state with many rural communities where attending classes would be too inconvenient. UIU’s online MPA program is designed specifically for adult learners to negotiate around their work schedules, bringing top-quality public policy and management education to the region. UIU’s online MPA is taught by experienced professionals and requires no residency, and UIU’s low tuition, especially for a private university, have helped UIU win notice as a best value across the US. The University of West Florida is a mid-sized public university in the State University System of Florida, recognized by the Princeton Review as a strong regional university. UWF’s student body is augmented by four nearby military bases, giving UWF a reputation as a military-friendly school, and their low tuition has landed UWF on a number of best value rankings. In keeping with the regional university mandate, UWF’s programs are focused largely on professional studies and applied sciences. UWF offers a fully online MPA degree with a specialization in Public Administration. This interdisciplinary program is designed for experienced professionals and recent graduates, with the mixture providing pre-professional students the opportunity to build their network and improve their employment prospects with their professional classmates. At a low $384 per credit, UWF makes their online MPA an attractive investment sure to show a return. As an independent public university, Indiana State University is not affiliated with the Indiana University system, and has paved its own way since its beginnings as a teacher’s college. ISU has a place in the Princeton Review’s Best in the Midwest category, and high marks from U.S. News & World Report for the Scott College of Business. Indiana State has a reputation for community engagement and service, making it a major part of life in and around Terre Haute. That institutional concern for public good and community improvement certainly informs ISU’s online MPA degree program. ISU’s online MPA is specifically directed toward experienced public service professionals, building on that experience with coursework, networking, and a capstone project. Students without experience will also be required to take an internship. ISU’s low tuition makes it a natural choice for prospective social service workers in Indiana and across the Midwest. A private, evangelical Christian liberal arts university in Riverside, CA, California Baptist University is one of the most respected Christian institutions in the west. Founded in 1950, in just over half a century CBU has grown from a tiny college to a nationally-known university. In recent years, CBU’s online degree programs have attracted the notice and accolades of U.S. News & World Report, brining CBU a new source of pride and recruitment. One of those programs is CBU’s online MPA degree. As a Christian university, CBU prepares their MPA students not only for critical thinking and problem-solving in leadership positions, but ethical decision-making, integrity, and community service. CBU’s widespread connections and partnerships throughout Southern California give students assurance that their degrees will send them successfully into their professional lives, whether in public, private, or non-profit work. Southern University and A&M College is a historically black university with a proud history and a bright future. Not only did Southern provide public, land-grant education for African-Americans during the era of segregation in Louisiana, but it remains one of the only HBCUs with a law school and an engineering school, providing support for black students in these crucial areas. Today Southern makes its top-quality education even more available with fully online degree programs. Southern, like the University of South Dakota (#18), offers an Executive MPA degree online designed for working public service professionals with at least three years of experience, preferably in the public sector. Southern’s low tuition rate only increases their accessibility, providing an opportunity for working adults throughout Louisiana and the Deep South to move ahead in their careers. As the first and oldest of the six senior military colleges, Norwich University’s reputation is one of intellectual rigor, academic discipline, and public service. Norwich was the founding home of the ROTC and the model for all other military colleges in the US, such as the Citadel. While the undergraduate student corps of cadets is largely on-campus, graduate students consist of many active-duty military, so Norwich has built one of the strongest online degree programs in the nation. The appeal of public service administration for veterans makes sense, and Norwich’s online MPA is designed for a diverse student body made up of veterans, active-duty personnel, and civilian public service professionals. Norwich’s MPA offers eight concentrations and flexible, convenient course designs to help students earn their degree on their own time. Some of the most experienced faculty in the world – military, criminal justice professionals, executives, and more – make Norwich a bargain for veterans. Ranked as a top regional public university in the South by U.S. News & World Report, Troy University is the flagship of the four-campus Troy University system, part of the larger Alabama State University system. Troy provides educational opportunities for students not only in southern Alabama, but across the state, nation, and world; through extension campuses and online degree programs, Troy claims the title of Alabama’s International University. Troy’s online MPA program is available anywhere in the world without any extra out-of-state tuition costs, making it a favorite internationally, especially for military personnel. The online MPA can be completed in just over a year of full-time coursework, with convenient scheduling for working professionals and busy adult students. As a public university, Troy keeps costs down, making the Toy MPA a top choice all over the world. Barry University is one of the largest private Catholic universities in the Southeast, its campus in Miami Shores, FL supplemented by adult education centers and a growing online program. Barry was founded as a liberal arts school for girls, but over time has expanded to include coeducational graduate programs, professional education such as business and nursing, and, most recently, a law school. Barry’s Rooney School of Professional and Career Education offers a fully online MPA degree program. Based on the Dominican order’s values, Barry’s MPA emphasizes responsibility, commitment to truth and justice, and public service. Students in Barry’s online MPA are expected to be mid-career professionals preparing for a life in service, and the online format, as well as a reasonable tuition, make Barry a top value. Northern Michigan University is a small, regional public institution and the heart of academic life in Michigan’s Upper Peninsula region. The Upper Peninsula, mostly enclosed by the Great Lakes, is a remote and sparsely-populated area, and Northern Michigan University brings not only education, but technology to the region, having wired the entire city of Marquette for high-speed wireless internet, an initiative that brought President Obama to champion NMU as a model for the future of university-civic partnerships. Because the population NMU serves as a regional university may be spread-out, finding it difficult to reach campus, NMU has invested heavily in online education. NMU offers a top 50 MPA program fully online, designed for both working professionals and recent college graduates. Concentrations include Criminal Justice Administration, Human Resources Administration, State & Local Government, and Public Management, all at a low tuition rate. The foremost private research university in Southern Florida, the University of Miami is known for its educational excellence and for its status as one of the most diverse universities in the nation in race and class. UM has a large Hispanic student body, and it is one of the premiere places in the US to study Cuban culture and heritage. The University of Miami’s dedication to its community and region pairs well with its Master of Public Administration program, designed to help present and future public service workers prepare for the needs of modern communities. UM offers a fully online MPA taught in convenient 7-week classes, all of which can be completed in less than 2 years. UM’s tuition is not cheap, but the University of Miami’s job market reputation and graduate ROI make it an investment students can trust. A private, evangelical Christian liberal arts college in Jackson, MS, Belhaven University is a historically Presbyterian institution that originated as a school for girls. While Belhaven is best known for its liberal arts programs, especially in the fine and performing arts, Belhaven has also been recognized for its social programs. Belhaven educates students through an explicitly Christian curriculum, with all subjects taught from a Christ-centered worldview. The Belhaven MPA degree is available through a fully online, adult-learner focused format, with twelve 8-week courses making up the basic MPA curriculum. Short course periods and online coursework make the program convenient for those already working in the field. As public policy and management are taught from a Christian perspective, classes emphasize ethical action, Christian values, and responsible service to the community. A small, Catholic liberal arts college in the quaint New England town of Paxton, MA, Anna Maria College combines traditional Catholic liberal arts values with professional studies to meet the mission of the Sisters of Saint Anne, founders of the college – public service, responsibility to humankind, and education as a means to do good in the world. Increasingly, Anna Maria College has found online education the speediest and most accessible vehicle to that end. Anna Maria’s online MPA degree program offers a host of individualized tracks for students to put together the education experience that best prepares them for the area of public service they wish to join. Five specializations include Criminal Justice, Emergency Management, Fire and Emergency Services, and Homeland Security, besides the General track; working professionals with at least 4 years of public service experience may also waive as many as two courses, making their program 6 credits shorter and even more of a value. Founded by Christian TV broadcaster Pat Robertson in 1977, Regent University is a private evangelical institution in Virginia Beach, VA. Regent – named for Robertson’s conviction that all leaders in the church are merely regents, or proxies, for God – is highly regarded in the Christian community for their traditional on-campus programs, but since the advent of online education Regent’s star has risen considerably, with U.S. News & World Report ranking Regent’s online program one of the best in the nation. Regent’s Robertson School of Government offers a fully online MPA program presented as the first MPA established from an evangelical Christian perspective. Students in the Regent MPA study public policy, history, political science, and other aspects of public administration with an understanding of how Christian values mesh with public service. Regent’s reasonable tuition rates keep an online MPA affordable, making Regent a solid top 50 value. The #50 Best Value Online MPA Program comes from Southern Utah University, a small, regional public university. Located in the small town of Cedar City, UT, SUU’s mission is to provide education to the rural areas of southern Utah, an area with spread-out, sometimes remote populations. Because of those challenges, online education has become a major part of SUU’s work, and they have been recognized as one of the most affordable colleges in the west. Southern Utah University’s on-campus program is marked by a strong dedication to Service Learning, a commitment that informs the MPA program as well. SUU offers an MPA degree program that can be earned entirely online, equally effective for both working public service professionals and those wishing to enter the field. With a focus on critical analysis, understanding of policy issues, and leadership and decision-making skills, the Southern Utah MPA is a top-quality program at a great price, a fitting close to the top 50 Best Values.